Interesting in America how the blending of cultures can cause some humorous misunderstandings. Take for instance the Filipino rice cake called Puto. Puto in Spanish means, well if you don't already know look it up on Google. 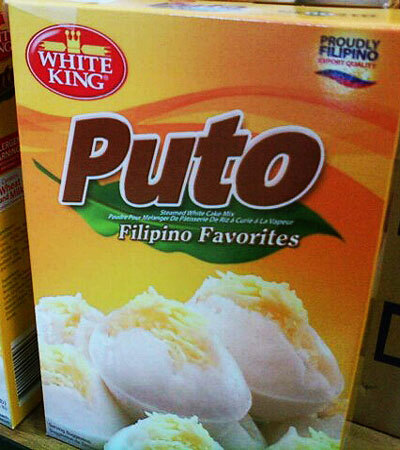 Now how in the heck did a culture with Spanish colonial influence name a rice cake PUTO? Was it a joke? Did someone not like the baker? This should be interesting to find out. Well it turns out the Philippines has influences of many cultures in their food, Chinese, Japanese, Polynesian-Malay, Asian Indian, and Spanish. With this mixture of cultures it leaves a lot open for misinterpretations of languages. 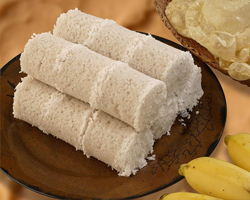 The name Puto comes from a similar Asian Indian dish called Puttu which is steamed cylinders of rice layered with coconut. Puttu means 'portioned' in Tamil and as the dish is prevalent in Tamil-speaking areas in South India and Sri Lanka this is the likely origin of its name. Obviously this speculates trade between South India and the Philippines probably during the Austronesian migrations of the region and rice was the staple of choice in Southeast Asia. When my mom made Puto she used Bisquick instead of rice flower. I didn't know her puto cake was different from the traditional puto (I'm laughing as I'm writing this) but I love the Bisquick recipe better. So if anything significant comes of this it's the fact that bisquick puto is of Filipino American origin therefore Bisquick puto is an American puto cake. LOL! Not quite like mom's but close enough. Well I don't have a recipe passed down from my mom so I looked one up on the Internet and chose one I thought might be close to the way my mom used to make it. The picture to the right is puto I made from scratch not using a recipe but close to the recipe below. I don't put cheese on top because I like them plain. I may experiment with cheese next time. Might even try cream cheese in the middle. But for the most part I still like it plain just like mom used to make. In a bowl, mix all the ingredients (except cheese) until well combined. 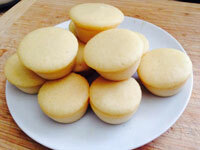 Grease puto molds or line with paper cups. Pour or fill the mixture in the prepared molds (at least 2/3 of the mold) and top with cheese. Prepare the steamer by bringing water to a boil over medium-high heat. Place the molds into a steamer. Cover with cheesecloth to avoid water drip. Steam for 15 minutes or until toothpick inserted comes out clean.